Ice cold drinks and fresh simple food will satisfy your hunger without slowing you down at the Ridge Snack Bar. During the summer months, the Ridge Snack Bar located within the Ridge Pro Shop at the 9th green offers a line-up of barbeque favourites and cold beverages daily. Indoor and outdoor patio seating space offers spectacular views of the course and provides a casual atmosphere. Whether you're joining friends to recap your incredible day on the course or just passing through, the Ridge Snack Bar serves as a favoured meeting place for golf enthusiasts. 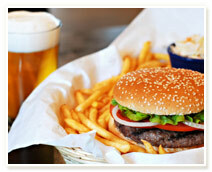 The menu features a selection of quick serve hot and cold items, specializing in casual barbeque options.